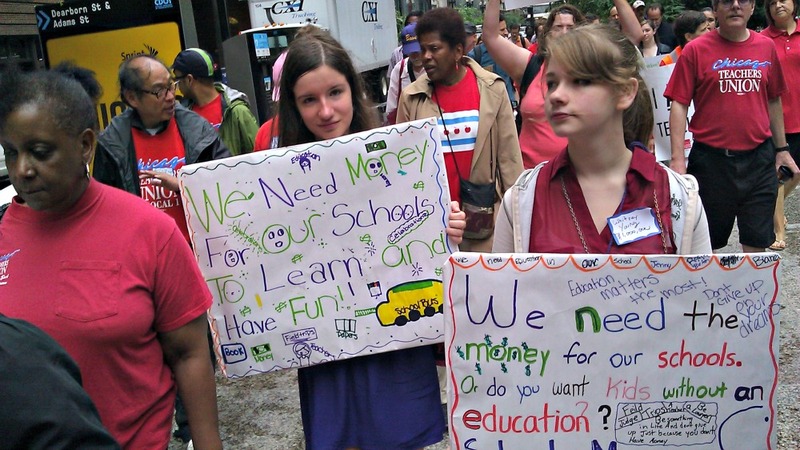 Protesters challenge budget cuts at schools outside the Board of Education Wednesday. Teachers, students, parents and activists from two dozen Chicago schools descended on the Board of Education Wednesday to protest what they say are “deep, painful” budget cuts at local schools. The citywide parent group Raise Your Hand says it has documented more than $80 million in cuts from over 100 local schools. CPS has refused to say how much it’s cutting from schools. Speakers Wednesday urged board members to use their political clout to demand that TIF funds destined for developers be channeled back to education. But board member Andrea Zopp said it was “magical thinking” to assume there’s a pot of money hidden somewhere. The school system says it faces a $1 billion deficit, which is about 20 percent of its operating budget. The mayor and school officials say their problem stems from pension bills that balloon this year—payments are increasing from $196 million to more than $600 million, as help from Springfield expires. The situation pushed a handful of students to get unruly at the board meeting. Israel Munoz just graduated from Kelly High on the Southwest Side—the school is slated to lose $4 million, 23 teachers, a beloved theater program, and more. Parents and students from the city’s best schools also spoke out. “We’re losing our writing center, which when it comes to college applications, the writing center has a lot to do with helping review college essays for students,” said Whitney Young junior Mac Carroll. In Chicago, pension obligations compete directly with current funding for schools. In other news, the school board gave a new lunch and milk contract worth $107.3 million to Aramark. School officials said the contract saves the district $12 million. And it steers CPS away from the lunch vendor it had used for more than a decade, Chartwells Thompson, which had come under fire for ethics violations. The board also doubled the size of its Safe Passage program, and it approved two new alternative schools to try to re-enroll and graduate thousands of the city&apos;s more than 50,000 dropouts. The schools will be publicly funded but are privately run. One, Camelot, is a for-profit company that will open in the old Guggenheim Elementary, which the district shut down in 2012. The other is a charter school that will be allowed to open multiple locations.